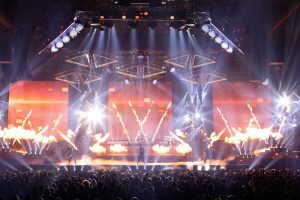 UNCASVILLE, CT (September 7, 2018) – Marking the band’s 20th consecutive year of touring, Trans-Siberian Orchestra (TSO) announced its highly – anticipated Winter Tour 2018. TSO’s annual multi – sensory extravaganza, which sells out venues year after year, has cemented the group’s status as a must – attend, multi – generational, holiday tradition. This year’s 20th anniversary tour, a presentation of TSO’s unforgettable The Ghosts of Christmas Eve, featuring founder/composer/lyricist Paul O’Neill’s timeless story of a runaway who finds her way into a mysterious abandoned theater, will visit 65 cities across North America, returning to Mohegan Sun Arena for two shows on Sunday, November 25th at 3:00pm and 8:00pm. TSO’s Winter Tour 2018 is presented by Hallmark Channel. Tickets are $72.50, $62.50 and $43.50 and go on sale Friday, September 14th at 10:00am through Ticketmaster. Ticketmaster customers may log on to Ticketmaster.com or call Ticketmaster’s national toll free Charge By Phone number 1.800.745.3000. Tickets will also be available at the Mohegan Sun Box Office beginning on Saturday, September 15th, subject to availability. This year’s tour will include new awe – inspiring effects, as well as amazing staging with an all new design from the dedicated team handpicked by the group’s late creator, Paul O’Neill. The rock opera also features such enduring fan – favorites as “Christmas Eve/Sarajevo 12/24,” “O’ Come All Ye Faithful,” “Good King Joy,” “Christmas Canon,” “Music Box Blues,” “Promises To Keep,” and “This Christmas Day.” Additionally, the tour will enjoy a new second set containing some of TSO’s greatest hits and fan – pleasers. As in all previous years, a portion of every ticket sold benefits select local charities. To date, more than $15 million has been distributed from TSO to worthy charities all across North America.